Homemade granola is so good–I started making it a few years ago and I guess you could say I’m hooked on homemade granola! I’ve made several granola recipes, including Vanilla Almond Granola, Pumpkin Spice Granola, and Dark Chocolate Granola Bars. I like experimenting with different variations and flavors, and I decided to try a version with some fall-inspired flavors like maple syrup, cinnamon, and raisins. There’s nothing fancy about this granola, but it has that great classic cinnamon-raisin goodness. And the maple syrup makes a wonderful natural sweetener. There’s no sugar in this, just the sweetness of the maple syrup. Which is great if you’re trying to cut back on sugar. And even if you’re not, it’s still a really good granola! In a small bowl, blend the maple syrup, oil, salt, and ground cinnamon; set aside. In a medium bowl, toss the oats, walnuts, pecans, coconut, sunflower kernels, pepitas, and wheat germ (you’ll be adding the raisins after the granola is done baking). Mix in the maple syrup, oil, salt, and cinnamon mixture and toss again, combining and coating all ingredients well. Spread this mixture on parchment-lined baking sheet. Bake at 325˚F for 20 minutes; remove pan from oven to stir and toss the mixture for even baking. Return to oven and bake for an additional 15 minutes, until mixture is golden. Remove from oven and add the raisins to the mixture on the pan; toss to combine. Let mixture cool completely on pan, then store in a tightly-sealed container for up to 2 weeks. This granola is great with milk or sprinkled over vanilla yogurt for breakfast. And it makes a great snack any time of the day. It’s not super-sweet, but everyone who tasted this for me said it was sweet enough for them. 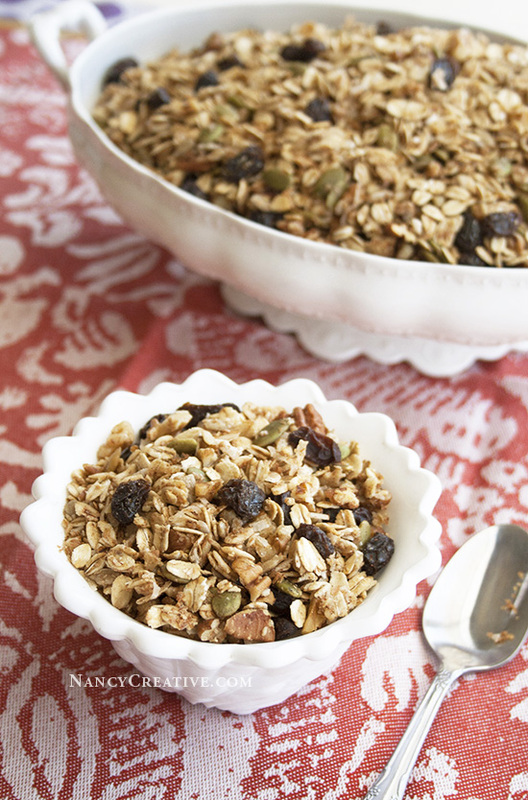 Do you make you own granola and do you have a favorite recipe? Linked to Fiesta Friday, Sunday Features, Simply Sundays, Nifty Thrifty Sunday, Inspire Me Monday, Show and Share, Wonderful Wednesday, Wow Me Wednesday, Whimsy Wednesday, Wow Us Wednesdays, Wake Up Wednesday, Full Plate Thursday, Create It Thursday, Inspiration Thursday, Thursday Favorite Things, Showcase Your Talent Thursday, Share Your Style, Fabulous Foodie Friday, Feathered Nest Friday. This entry was posted in Breakfast/Brunch, Food and Recipes, Healthy Eating and tagged granola, maple syrup, pecans, pepitas, rolled oats on October 16, 2015 by nancyc. I love granola, it is breakfast, a snack and a weak addiction for me. I will hold the wheat germ and make it gluten free for me. Pinned! I love it, too. 🙂 Not using the wheat germ is a great tip for those on a gluten-free diet! This is a great snack to take on a hike! I’m trying to enjoy the outdoors as much as I can, too, before the really cold weather gets here! I love this stuff, and prefer to make my own. The stuff in the store is horrible. It either tastes like dust or it’s 140 calories for a tablespoon! I agree, Julie–homemade granola is so much better. The store-bought granola is usually too sweet for me! We are on the same page this week with making granola! 🙂 Yours looks really good, Nancy! The fall spices make it really fun. I love that you can customize granola and make it your own. Yes, we both had granola on our minds! 🙂 Your Pumpkin Spice flavor looks so good! Hi Nancy, you have the best granola recipes. Really great granola Nancy, love making it. I like all the seeds and nuts in your recipe. It really does sound delicious. wow i like addition of all the seeds and nuts in there…looks great Nancy..
Hi Nancy! Your granola recipe looks great! The maple and cinnamon combo sounds absolutely perfect. Pinning! Thanks for sharing at Inspiration Thursday! This looks so delicious! I’m visiting from Thursday Favorite Things. Hmmmm, good! I can’t wait to make this and I like that it’s not real sweet. Thanks so much for sharing. I’m a new follower and look forward to more recipes! what a delish way to start the day! I have only made granola once and I loved it – should really make it more often. We will really enjoy your awesome Granola. Thanks so much for sharing with Full Plate Thursday and have a great weekend! Thanks, Miz Helen and hope you are having a great weekend!